Veracruz- Now it's Senator Gloria Sánchez turn to cause scandal and controversy, affirming yesterday, during a press conference, that the media "are magnifying the drama and favoring a very bad policy of destructive opposition", referring to the coverage that the media has given to the Minatitlan massacre , where 14 civilians lost their lives, including a minor. Of course, after backlash, the senator tried to apologize in a press release saying she was taken out of context and respects objective media. 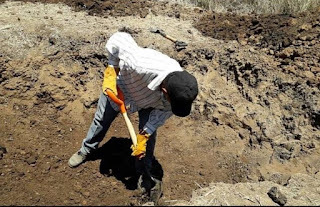 The Nayarit Prosecutor's Office indicated that the number of corpses recovered in a clandestine grave located in a plot in Valle la Saucera, belonging to the municipality of Xalisco, amounts to 21. According to NTV, the organization Familias Unidas por Nayarit reported on April 6, the presence of foul odors in said pit, and later the Office of the Prosecutor began the excavation work. Elements of the Mexican Army detained Alexis "N", alias "El Chofo" , in the municipality of Lagos de Moreno, Jalisco. The subject, who is 21 years old, is accused of several homicides and organized crime, generating terror in the region. 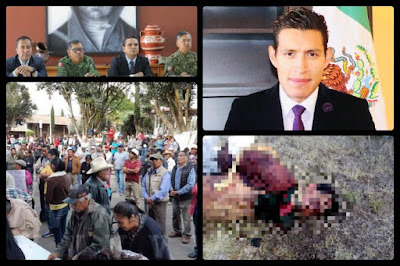 The crisis in Nahuatzen goes through one of its darkest episodes: David Otlica Avilés, municipal president was found dead with signs of torture in the town of Las Mesas, in the municipality of Coeneo. During the early hours of this Tuesday, subjects kidnapped David Otlica from his home and deprived him of his life. The dawn of this Tuesday, David Otlica Avilés was kidnapped by a group of unknown men who entered his house. 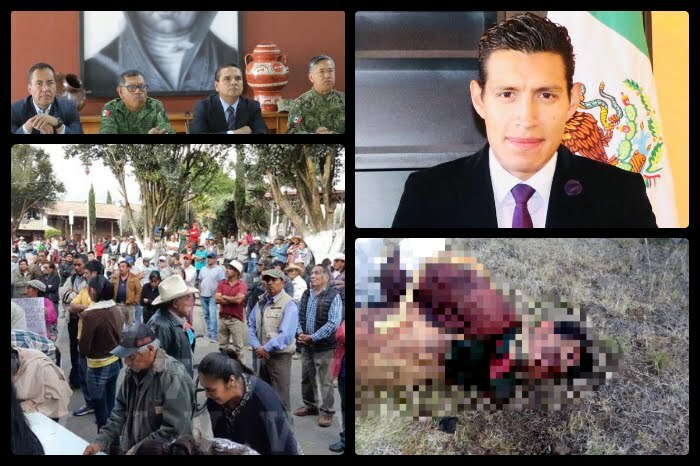 The municipal president of Nahuatzen, David Otlica Avilés , was assassinated, the secretary of Government of Michoacán, Carlos Herrera Tello , confirmed on this Tuesday. Through his official Twitter account, the official condemned the event and stated that as an authority, they will help to clarify the facts and punish the guilty parties. "From the @GobMichoacan we condemn this event and we will cooperate in everything necessary with the @FiscaliaMich, in order to find those responsible and bring them to justice. There will be no impunity! "Was the text posted by Herrera Tello. In the same manner, he expressed his condolences to the family and friends of the municipal president of Nahuatzen. Yaqui for Borderland Beat from: PorEsto! 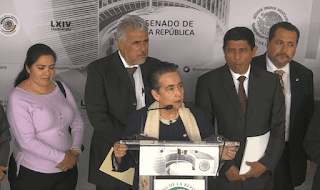 The businessmen of the municipality of Minatitlán have denounced that several investments have been dropped due to insecurity problems facing the municipality and they fear that the repairs in the refinery, for the same situation. In the same manner as the March for Peace, Minatitlán's productive sectors convened to demand the clarification of the murders of 13 people inside a party hall, the businessmen pointed out that the situation regarding security and law enforcement is unsustainable and the Delinquency groups operate in freedom. María Eugenia Ramírez Arana, one of the people who led the march, said she requested from the state and federal governments, greater security, after the violent events that occurred last weekend. Alberto Sánchez López, president of the regional council of security and citizen participation, pointed out that the growth of delinquency has caused many families to leave the city and close their businesses. Nuevo Laredo Tamaulipas: Mexican Army and shootout leaves 4 riddled with bullets--CDN or CJNG? Four subjects were killed in an armed confrontation against elements of the Mexican Army in Nuevo Laredo, Tamaulipas. The events occurred around 3:00 p.m. 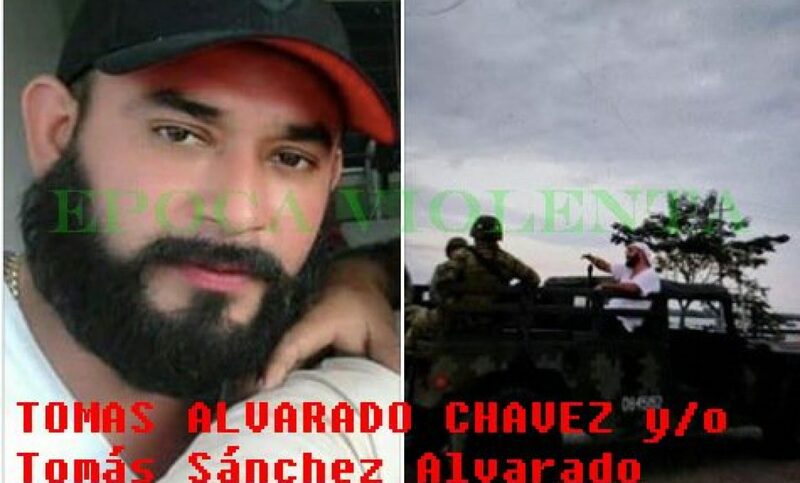 According to the Secretariat of National Defense (Sedena), the subjects circulated aboard a gray Chevrolet Tahoe truck, when they detected the military convoy in the cruise of Colón and Reforma, and were gunned down. The military repelled the aggression and persecution ensued. The men armed in their flight left the so-called "poncha-llantas", however it did not stop the military. What’s a little prison time between friends? Correction no actual prison time, all theater. 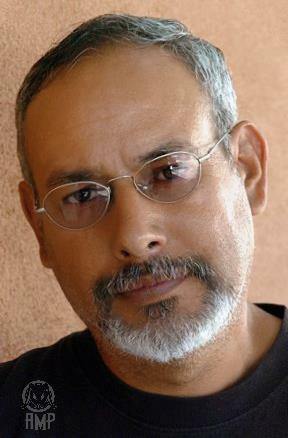 Yesterday, political actors of PAN, PRD and Movimiento Ciudadano, considered that the return of assets to the former chief of Mexico’s teacher union, was the result of a ruling by a Federal Judge, therefore a sign that the Government of López Obrador does not fight corruption and puts forward the alliance that wove with the former SNTE leader in the past elections. 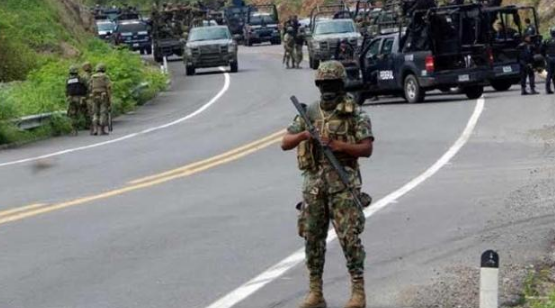 CDMX, April 22, 2019.- Two lieutenants of the Jalisco Nueva Generación Cartel (CJNG) would be responsible for the massacre that happened in Minatitlán, last Friday , which left 13 people dead. 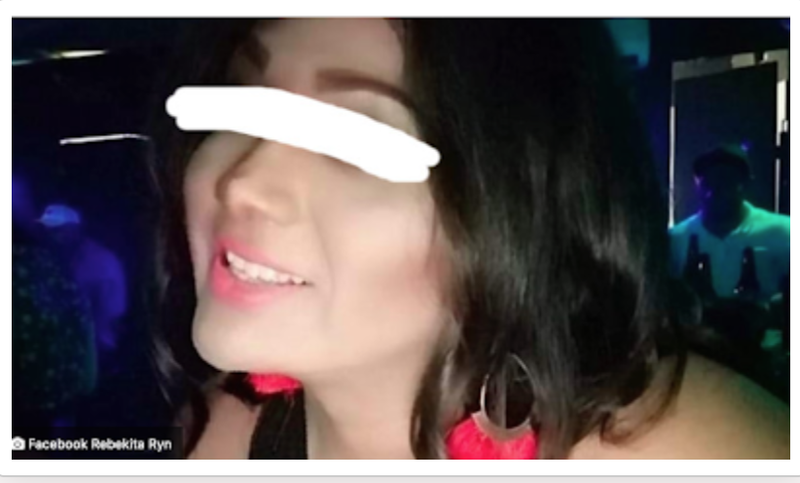 "El Lagarto" had ordered the massacre after Julio César Gonzalez Reyna, aka "La Becky", sought refuge at a party after escaping from the people who sought to extort money from him/ her. Irapuato, Guanajuato: Four young people between the ages of 22 and 27 were murdered on a property in Irapuato. Neighbors reported that the armed group took a woman who lived with the four victims. The men were identified only as "Juanito", "El Güero"; José, alias "El Chepe" and / or "Pepe" and "Chuy". In addition, the neighbors pointed out that the site was a refuge for the survivors. The multi homicide occurred yesterday around 7:30 in the afternoon in the Garden of the Princes area , of Colonia Flores Magón Norte of Irapuato. Apparently 11 men in two vehicles entered the property holding and aiming guns. Guanajuato- In a joint operation, the state attorney general’s office, the state public security secretariat and the ministry of the Mexican Navy, Detained Eliseo “N” aka “ El Titi” identified as one of the main leaders of the Cartel Santa Rosa de Lima, commanded by José Antonio Yepez aka “El Marro”, supposedly one of Marro's right hand men. 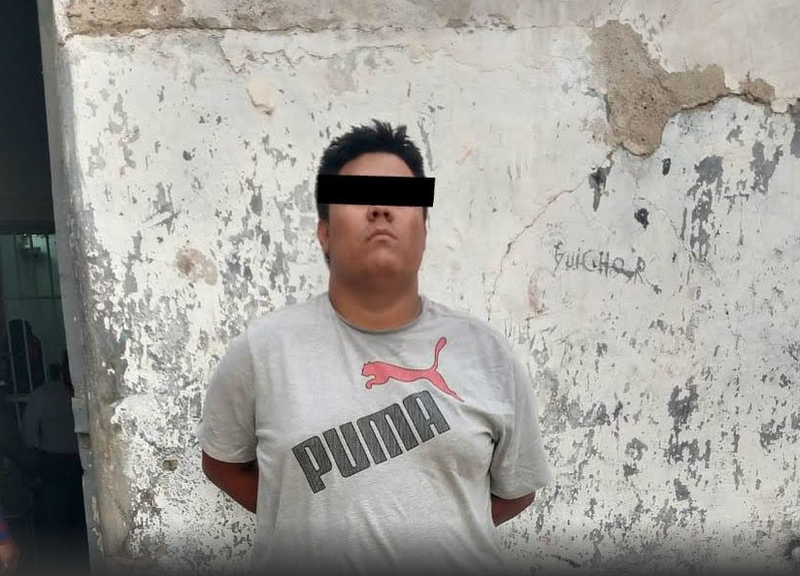 The arrest was made in a search of two buildings in the community of Neutla, in the municipality of Comonfort, Guanajuato, along with two others. Seized in the operation was an arsenal, drugs and several vehicles. In the interinstitutional operation, the state and federal forces also located at least four bodies. Chetumal.-Eder EH, was threatened Friday morning, in a narcomanta placed in Chetumal; Shortly before midnight, when traveling on José Sulub street, between Ramón F. Iturbide and Francisco J. Mújica of the colony "Santa María", he was riddled with firearms by subjects aboard a vehicle. The victim was driving his BMW when another car pulled up along side of his car, from where the perpetrators shot him at least 17 shots. The victim was known as "El Lobo" and allegedly engaged in the sale of narcotics. This Monday the governor of Oaxaca Alejandro Murat, announced the closing of the state borders with Veracruz, this after the events that took place at the party in Minatitlán, where a multi-homicide was registered that ended with the lives of thirteen people. He called the action a stopgap to secure his state from “contamination” from Veracruz. "This week we started operations and checkpoints with mixed operations bases with the Ministry of National Defense (Sedena). At all access bridges with the border of Veracruz, no one will be able to pass without acceptable identification. If a person lacks correct documentation such as plates and your license, "said Alejandro Murat. 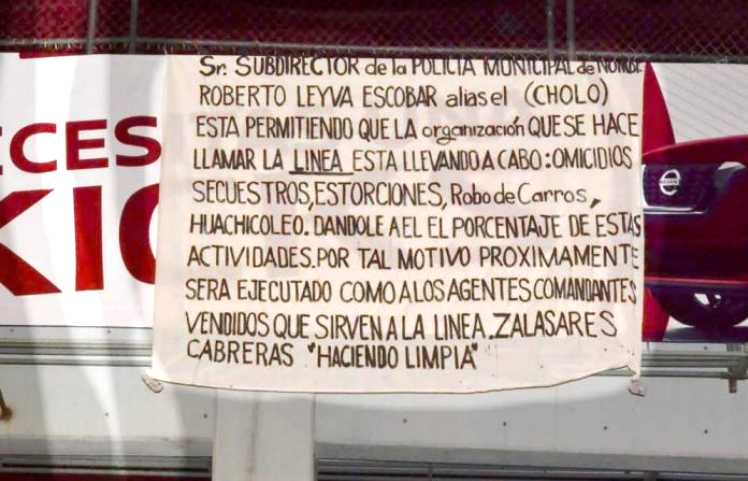 Elements of the Municipal Public Security Directorate located a narcomanta in República de Costa Rica Street and La Cantera Avenue where the deputy director of said corporation, Roberto Leyva, is threatened. 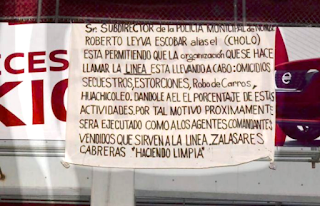 The narcomanta accuses the Subdirector of the DSPM of supporting a criminal group in the town and assure that he will be killed by the “other side”. He is also accused of receiving bribes for high impact crimes. For at least 12 years, the former governor of Quintana Roo and former senator, Felix Arturo González Canto, along with the former state governor, Roberto Borge Angulo, have been repeatedly singled out for their alleged ties to drug traffickers; today they are mentioned again, but internationally, in the trial against Joaquín "El Chapo" Guzmán Loera, described as "the criminal leader of the largest drug cartel in the world". Jesús Reynaldo "El Rey" Zambada García, one of the leaders of the Sinaloa Cartel, third in hierarchy within the criminal structure, turned into a collaborating witness in exchange for benefits, points out those who were once his accomplices and exhibited not only to former governors, but to the military, police chiefs, high officials and even former presidents. 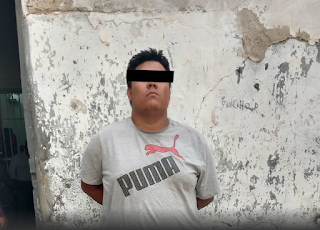 BB forum user “MX” reports that Osiel Cardenas has been transferred within the Florence Prison, from the ultra-strict ADX Florence to USP Florence High. 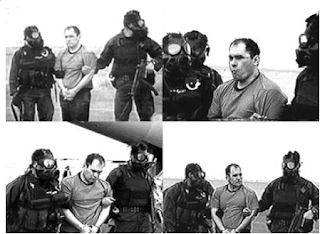 In 2009, after pleading guilty in U.S. Federal court, Cardenas, Gulf Cartel top boss, was sent to Florida prison where he enjoyed an array of privileges while in U.S. custody. 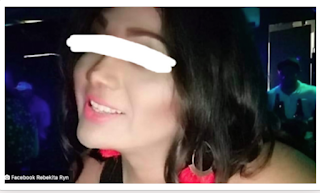 In the first minutes of this Friday a video began to circulate on social networks of a live transmission on Facebook, where armed individuals try to assault a driver on the Puebla-Tehuacán highway. 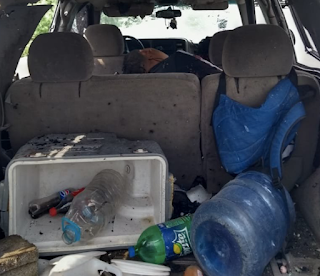 Although there is no certainty about the origin of the video, social networks viralized the images recorded from the inside of a vehicle, apparently a truck, that circulated on that road at the height of the vicinity of the municipality of Tlacotepec de Benito Juárez. The original video consists of just over 8 minutes of recording and it’s at minute one when you hear what appears to be a shot. Then you see a vehicle that tries to block the path of the truck. Yaqui for Borderland Beat from: PorEste! The State Prosecutor's Office confirms that the death toll of Friday's attack in the Minatitlan massacre of the family of "La Beky" is 13. The tensions are increasing before a few hours of the scheduled visit that President Andrés Manuel López Obrador (AMLO) will make to the State today. It is confirmed that the number of fatalities left by the attack that occurred on Friday night in a palapa party hall in Minatitlan, Veracruz, is 13. The massacre took place at La Potra Palapa on Primero de Mayo street where the family of "La Beky" had gathered. She was the target of the attack. The Borderland Beat Project is collaboration from a group of people of different backgrounds located in the US and Mexico that gather information related to the Mexican drug cartels and presents it in English through the internet, publications and presentations. 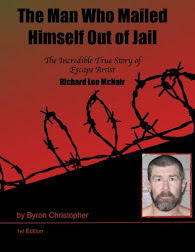 Almost all content in this book comes from the result of reporting in the Borderland Beat blog and, the personal experience and research of the author. It primarily covers a time frame when the author was an active contributor between the last part of 2008 and when he stopped getting directly involved around 2013. 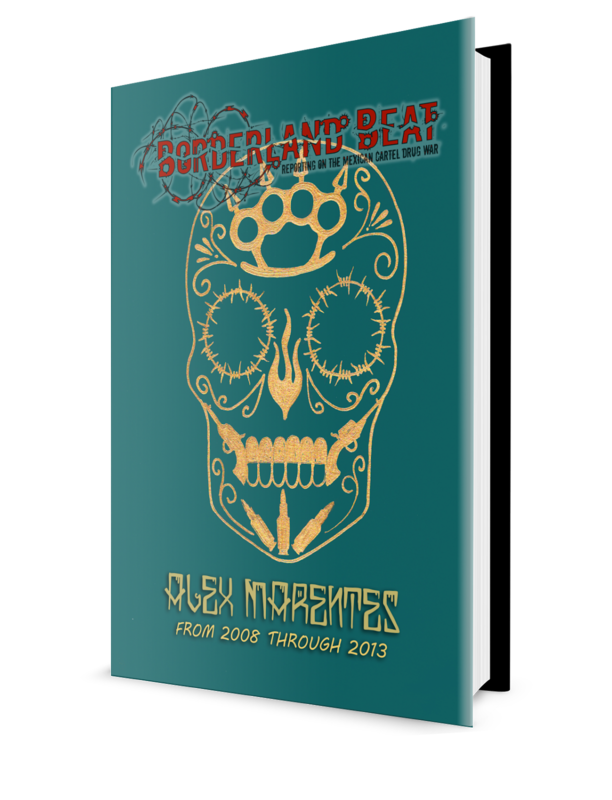 Information from this book is a reflection of the Borderland Beat blog that is derived from research, open media source, informal official authorities and people on the ground, which is gathered by collaborators from Borderland Beat Project. This represents the most extensive and comprehensive source of information between the years 2008 and 2013 covering a very wide range of topics related to the Mexican cartels and the Mexican drug war in Mexico and along the US/Mexican border. All material covered can be found at www.borderlandbeat.com. Congratulations Buggs! It has been a long time coming. Over the years, particularly when you were very active on BB, followers, including myself, would encourage you to write a book. I know you always had the desire to, what urged you to go forth? Well part of the reason was to inform people, especially English-speaking people who do not speak Spanish, about the cartel violence in Mexico. Part of the plan was to use any means to do so, the blog has been the main source to do that. I felt it was important to document my experience while contributing with BB and really try to reach a broader audience, who otherwise do not read the blog. This project was a passion of mine, like it was to many other contributors, from the past and present. People really need to know what BB is all about! I know your background but most do not. Can you give readers a synopsis? Where are you from originally? I know one of your brothers is a long time great humanitarian on the border. How many siblings in your family? Do they know of your project called “Borderland Beat”? I ask because only a hand full and one child of mine know of my work at BB. I was born in Ciudad Juarez, my father commuted every day to El Paso where he worked for Tony Lama making cowboy boots. We lived in a very poor community named La Cuesta that had no running water and the streets were made of dirt. The little house where we lived was built by my father and my two older brothers. When I was ten years of age, my father was fired from his job after the employees at Tony Lama went on strike to demand better wages. Because he could not afford to be unemployed, he moved to Albuquerque, NM to work with my uncle for the city. He was able to get us papers to move also, as he had permanent residency that he got when he worked as a bracero in the fields in Chicago during the 2nd world war. We were 12 children, but the youngest, Martin, was killed in Amarillo Texas several years ago. My siblings are spread out all over the US. 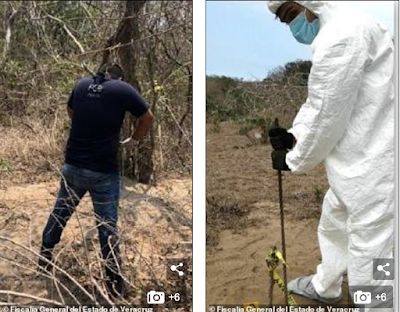 April 19 last year, the body of the 42-year-old Mexican rapper Mr. Yosie Locote was dumped in an empty lot in the western city of Guadalajara. A note claiming he had been killed because of a connection to an enemy of the Jalisco New Generation Cartel was pinned to his chest with a screwdriver. 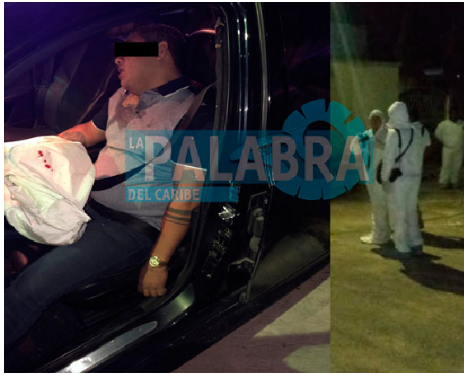 In a separate case three days later, authorities arrested another local hip-hop star, the 24-year-old Christian Palma, known as Qba, who confessed to dissolving the dead bodies of three film students in sulfuric acid on the orders of that same organization. Suspect with ties to criminal gang leads Mexican authorities to cartel's secret grave site where DOZENS of their victims are buried. The state government of Veracruz was tipped off to the location of a clandestine grave site. On Wednesday, police, military and a missing persons group began digging at the site which has at least 36 different 'graves'. Each of the grave sites can contain multiple people. So far, at least four craniums and other body parts have been recovered. State Attorney General Jorge Winckler said they learned of the secret burial site following the arrest of a suspect with ties to a criminal organization. In social networks, inhabitants of the area reported having heard more than twenty gunshots . According to the first versions, armed individuals arrived at the house and opened fire on the young artist of 35 years , his father and his brother Julio , director of the Colegio de Bachilleres number 15 in the municipality of Ébano. 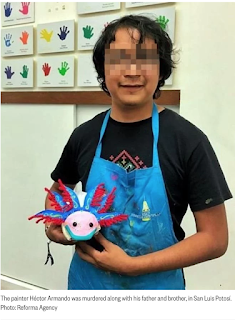 In September of last year, Héctor suffered an attack that left him injured, but he managed to recover after resuming his passion for painting and although he filed a formal complaint after the attack, there were never results. A Guatemalan presidential candidate was busted Wednesday by the DEA for conspiring to import “tons of cocaine” into the US for Joaquin “El Chapo” Guzman’s infamous Sinaloa drug cartel — and allegedly attempting to arrange the assassinations of his political rivals, according to prosecutors. According to the communiqué of the US justice system, of the seven documented occasions in which the candidate of the UCN and his aide negotiated the financing with the Sinaloa Cartel, in three of them they requested the physical elimination of two presidential candidates. Mario Estrada, 58, was charged in Manhattan federal court following a months-long investigation. He and another individual, Juan Pablo Gonzalez Mayorga, were arrested Wednesday in Miami and are scheduled to appear before a federal magistrate on Thursday. 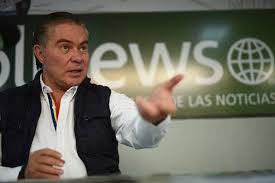 They are accused of conspiring to solicit cartel money “to finance a corrupt scheme to elect Estrada president of Guatemala,” according to prosecutors. 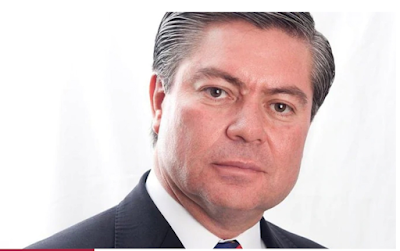 “In return, the two allegedly promised to assist the cartel in using Guatemalan ports and airports to export tons of cocaine into the US,” said Geoffrey Berman, attorney for the Southern District of New York, in a statement. 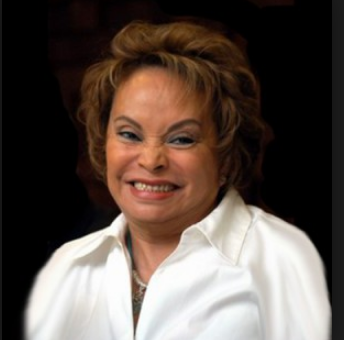 “As further alleged, Estrada and Gonzalez attempted to arrange the assassinations of political rivals.” The pair allegedly conspired to use and possess machine guns throughout their murderous election campaign.